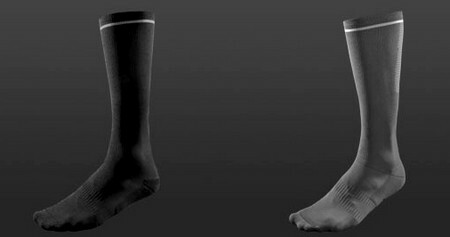 Compression Stockings and Precision Socks are available at Equmen. Enhances circulation: Therapeutic pressure helps improve the flow of oxygen in the blood. This can help to reduce the risk of Deep Vein Thrombosis (DVT). Energises Legs: Through enhanced circulation, helps to relieve fatigue and cramping, particularly during long periods of standing or sitting. Dissipates toxins: Static pressure helps to encourage toxin removal from the muscles. Targeted arch support: High-compression, body-response ribbing around the arch area for extra support. Controls temperature, moisture & odour: Targeted mesh, moisture-wicking fabric and anti-microbial properties ensure feet stay fresh.